Years ago, I read a book about Adolf Eichmann entitled, the Banality of Evil. It’s thesis was quite simple. Evil can come wrapped in a plain package. Someone doesn’t have to LOOK evil, to be evil. Linda Sarsour is a perfect example. By looks, she is a polite Muslim woman just trying to figure out why the world is so messed up; why her “people” have it to tough. The problem is, of course, that the facts don’t jive with her hypothesis. 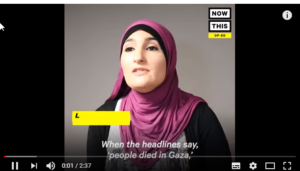 Most people in a situation like Sarsour, given the facts, would change their thinking. The only other option for Sarsour would be to lie. Lie about what is happening. Mold the facts to meet your incorrect assumption. Sarsour excels at lying. Twisting facts. Half-truths that trip up other people. Sarsour says she fights for the rights of women. Marches for those rights. And yet supports Sharia law which limits women’s rights and allows men to treat women as objects to be collected, abused, and disposed of. Honor killings. Wife abuse, and so much more. Boomerang Says it Like it Is in Arabic! 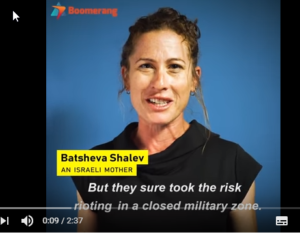 The Israeli mother is my amazing daughter in law!! Linda Sausour is a evil nothing.Nobody listens to her.She betrays her own womans rights.I detest her.We should and will get rid of her. How the public even listens to all her lies.Linda your 15 minutes of fame are up.